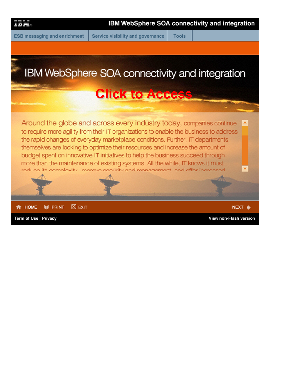 IBM WebSphere software provides the IBM SMARTT SOA approach to untangle the costly and debilitating IT complexity associated with point-to-point connectivity and integration, while maintaining high levels of reliability. As a result, IT is able to cost-effectively deliver fast and flexible application integration to improve the flow of information across an organization; position the business to adjust to dynamic business requirements and enable IT to seamlessly bridge to new connectivity technologies that are in such high marketplace demand today. The end result for the business is additional revenue opportunities and a higher return on investments.